The Fox and the Pirate! 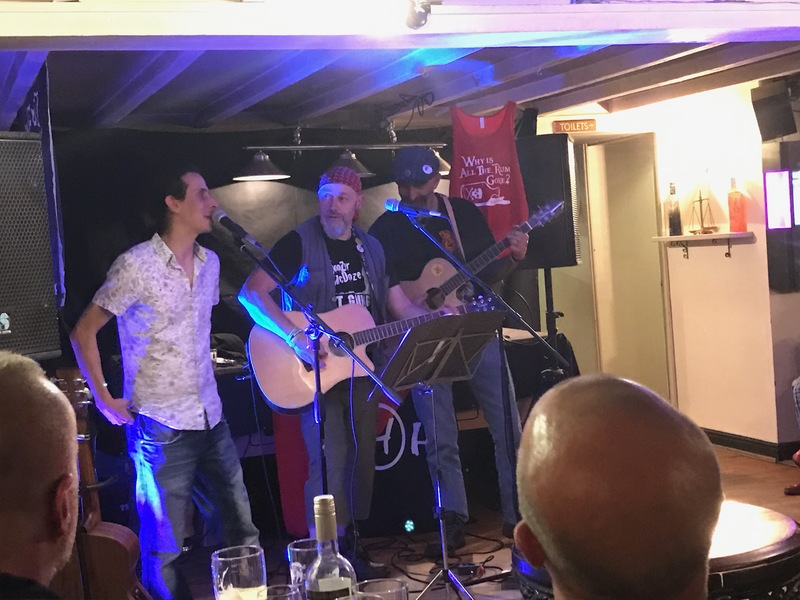 We had a lot of fun tonight at the opening night of The Fox and the Pirate (I think you need a Facebook page chaps if this is gonna be a ‘thing’) tour in the Yewtree Inn and Lodge in Ednaston, Derbyshire. They comprise of Jonny Wallis and Brian Stone, excellent musicians and friends both! Arriving in the car park we found the advanced camping party – Dave and Caroline (and Murph!) along with Barry and Debs were already in situ, getting the party started early! As we’d had daytime activities, and because we’d piked out as it was cold, we decided to just drive to and from the gig rather than stay over in the car park. Since I’m sat comfy in my lounge (albeit not toasty warm given the boiler is knackered!) it’s not a decision I rue, although a stay over is always fun. So after general car park catchups we made our way into the pub. It’s a lovely pub, great food and drink, a relaxed atmosphere and of course some excellent music. Brian and Karen were already in and tucking into some rather tasty looking pizzas. We’d not planned on eating as we’d had a massive meal earlier in the day, but the temptation was pretty big – we relented. A pizza for me and Ella more restrained with just a garlic bread (she can’t eat dairy – booo!) 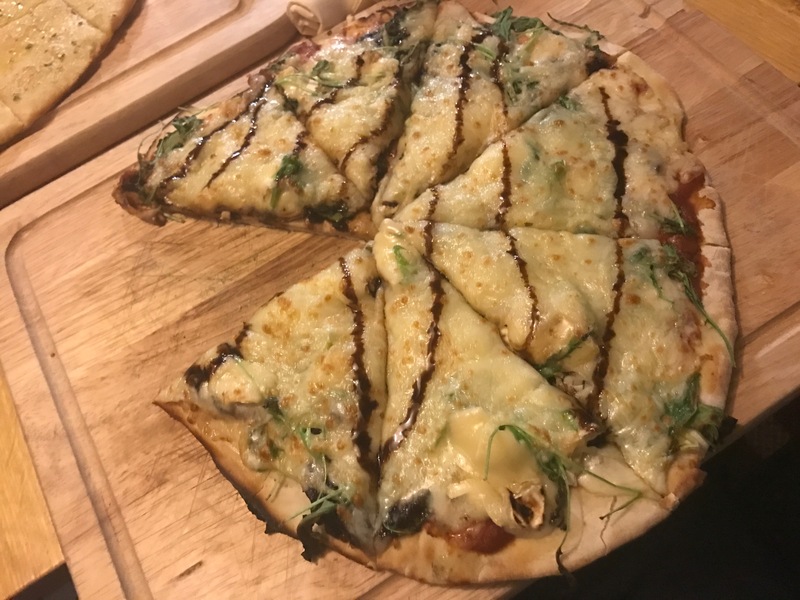 – it was bloody nice, although I’m sure Scott Doonican would have something to say about it being served on a wooden board (indeed, he did later via the medium of Facebook!). The plan for the evening was for Jonny and Brian to each do a set individually, and then come together as a duo for the finale – with a break in between each set. As folk started arriving it was proving to be a cracking turn out and a great chance to have a laugh with people in a more relaxed setting than we are often all together. Talk ranged from what we’d like inscribed on our tombstones to Mike the famous headless chicken. And pretty much everything in between. First up this evening was Jonny Wallis. I just checked, I first saw Jonny perform as part of 3 Eyed Fox back in November 2011, they were the first support act for a 3 Daft Monkeys gig, the second support were a certain canine-themed band you might have heard of. I didn’t really do music blogging then, but they did merit a brief mention on my personal blog from back then (which is seldom updated these days!). I remember being really taken with them, it was sad to hear they’re now officially defunct tonight. So Jonny had dressed up for the occasion, with a jazzy shirt and a jacket combination he was only a hat away from a Mark Chadwick costume. He kicked off with a cover of Eddie Vedder’s Hard Sun which he dedicated to the Parrys who couldn’t make it to the gig (he did exclude Morgan for being too talented though!). Next up was an impassioned and mixed pace original number called Social Grind (I think – he seemed to be mumbling his own song titles somewhat!). Another resurrected 3 Eyed Fox song next was either Not to Prepare or Rock to Prepare (as you read this you’ll be wondering much like I am why I didn’t think to just run my notes past him after and get some song titles!). It sounded dimly familiar so I must’ve heard the band version before – melancholy and melodic. It took a while for him to de-tune his guitar down to play Light The Darkness – it was worth the wait though, even if he had to endure heckling from even his mum during the process! He covered Battle of the Old Country by The Newcranes next which sounded great, one of those bands from back in the day I’m dimly aware of and that I really ought to get to know better. This was followed by an emotional piece inspired by the loss of his father, a really moving performance – Goodbye Lullaby is a wonderful tribute. The final song was another from the 3 Eyed Fox back catalogue – apparently it’s Folk the System’s Maty’s favourite – I missed the title again – it sounded like Grab a Rise and Smile but that can’t possibly be right! An ace start from Jonny despite the expansive guitar de-tuning session, haha! Brian Stone aka ‘The Pirate’ was up next. Like many he’d been struck by Bostin’ Flu so was cautious about how his voice would hold out. 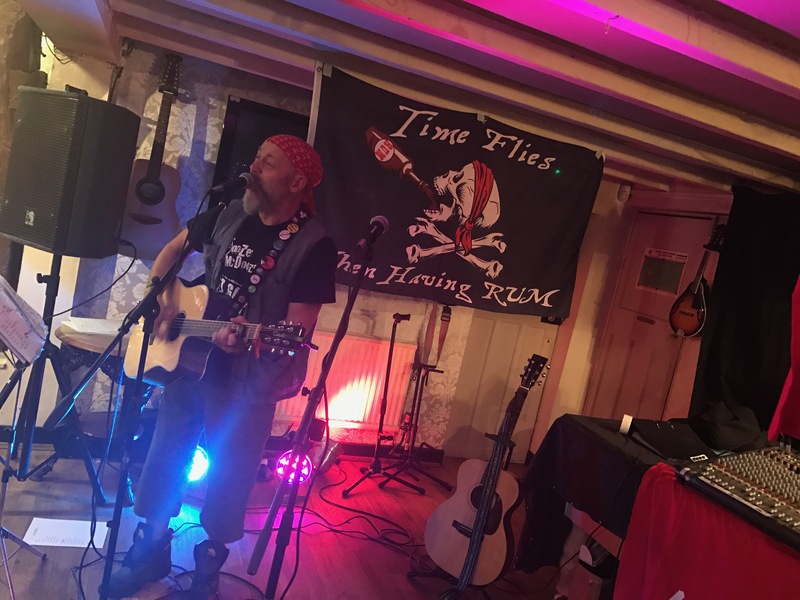 That said, he didn’t skimp when it came to performing – he kicked his set off with Ward The Pirate, which now of course has its own dance routine – we developed that slightly over the course of the night, Brian did very well not to crack up with our silly antics infront of him, haha! A new song was next, always exciting, it was only one of its earliest airings and was an autobiographical piece entitled Jack of All Trades (Master of none) – I can definitely relate to that, haha! Firm favourite Quiet Anarchist was next, I’ve acquired a sticker inspired by that to stick on my cajón which is quite excited. He dedicated it to Sophia, Ella and George who’d come to the gig with Rob and Annie – and one of ’em had presented Brian with an awesome drawing before the gig. Life Begins @ 50 was next, dedicated to Mark from Emma & The Professor as it was his birthday. Unfortunately that was the 2 minute window that John wasn’t live-streaming the gig to Facebook so Mark may never know about the dedication unless he reads it here or somebody tells him! Oh well! We enjoyed it if it’s any consolation, Mark! Next Brian performed a new song to me – Bella Ciao is an Italian partisan song originating from the Italian civil war – sounded great to me, standing up against fascism. Much as Jonny had shared an emotional and personal song, Brian did too with Did She Know – a song inspired by and charting the life of death of his mother – beautifully delivered, and a wonderful tribute and sentiment. 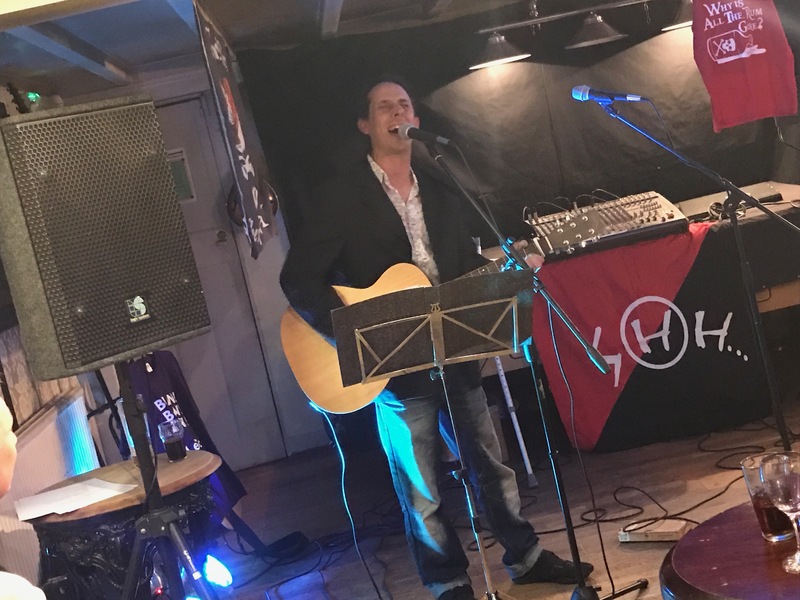 Much like Jonny too he finished his set up with a jauntier number – Never Drink With The Leylines is already fast becoming a bit of an anthem – ludicrously catchy and for anyone who’d attempted the feat, so so very true – the same goes for the other individuals named in the song! As if that wasn’t enough after a short break we had both Jonny AND Brian up on stage next. The started up with The Boatman with Jonny on main vocals. Oddly before kicking in with Barrow Downs and Brian singing we had a strange interlude of Jonny bursting into Cotton Eye Joe. That could be an interesting future cover version for their routine! Returning to The Levellers they went for Sell Out next, Brian tried to skip the first chorus but pulled it back from the brink with aplomb! A new song on me was Oh You New York Girls (Can’t You Dance the Polka?) – a derivative of a traditional shanty with many variants, Brian did confess at some point where they’d picked it up, but I missed it! Next up was a real treat, Brian on guitar and Jonny on vocals for Elation – now, it takes some balls to even attempt this number given Maelor and Chantelle’s version – but you know what, this stood up to it, Jonny’s vocals are mesmerising and Brian’s nailed the delicate guitar work. Mesmerising, even with the less than tuneful singing along from us lot accompanying! Dirty Davey was invited up from the crowd to join on guitar for Julie with Jonny providing the vocals (of course.. it’s become somewhat of a signature cover version for him, and rightly so, he sings it wonderfully). A raucous finish of Why Is All The Rum Gone finished up the set – including some energetic almost-moshing in front of the stage. 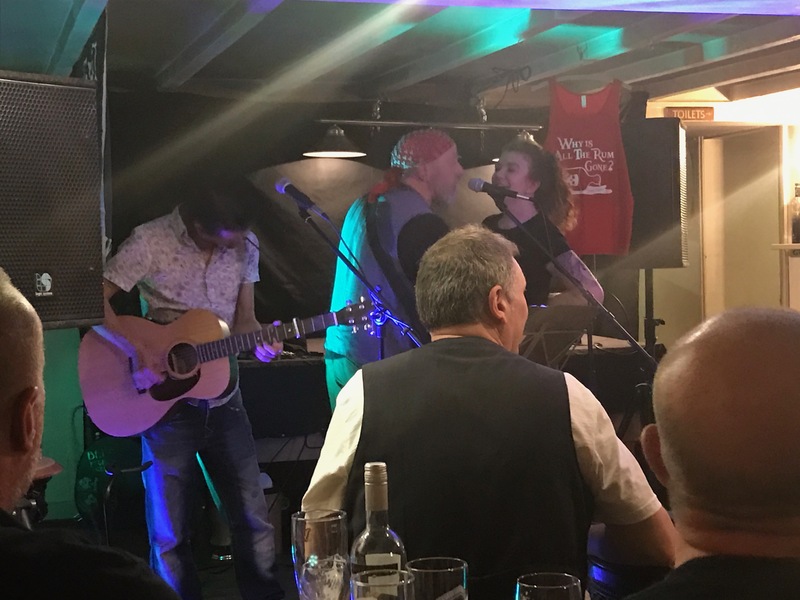 There was an encore – Let It Go by The Leylines perhaps inevitably saw Ella join Brian on vocals, and a mass singalong of Riverflow closed proceedings with Dave back on guitar and everyone providing backing vocals and ‘air fiddle’. Cracking set – a great start to Jonny and Brian’s touring together. The night ended with some unplugged jamming from assembled musicians. It’s times like that I wish I’d thought to stick my bangy box in the boot when I travel, it’s a great opportunity to get a bit of practice in! Eventually it was time to make our goodbyes, I bottled trying to get home on limited fuel so a diversion via a petrol station and eventually we made it home. What an awesome weekend. 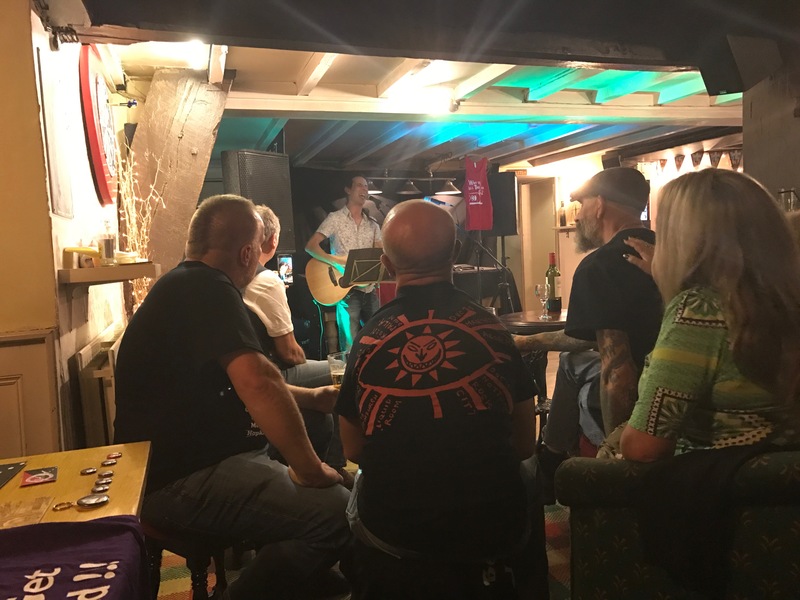 A big chunk of live music, a great atmosphere in a lovely setting with plenty of friends – big kudos to Chris and his team at The Yewtree – aside from the cost of food and drinks (all of which were very fairly priced) – this was a free evening’s entertainment, and you really can’t argue with that. 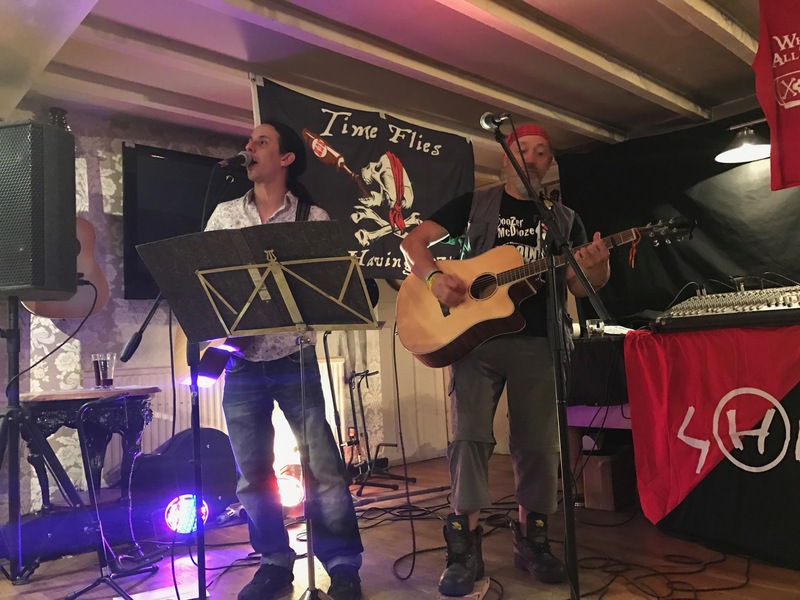 You should definitely check out future tour dates for The Fox and The Pirate – as guaranteed a good night’s entertainment as guaranteed can be!